Folk artist, Sweet Erin Thomas, will be performing at the Connely Gallery (across the street from the hotel) this Friday night, January 20th at 7:30. Sweet Erin's cousin, Edd Lowe, who is a family friend, forwarded her website information to me and I really enjoyed hearing some of her work this past weekend. 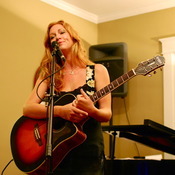 Check her out at http://www.sweeterin.com/fr_sweeterin.cfm and then make plans to come to Washington to hear her in person! Admission is free but donations will be accepted.